Wichita is right in the heart of the United States and right at the point where the Big and Little Arkansas Rivers join together. 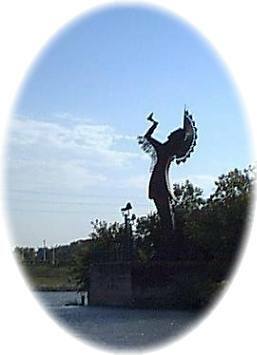 Native Americans still gather at this inviting and mystical spot marked by the majestic figure of the "Keeper of the Plains." The Wichita Indians who lived in this area gave our city its historic name. Later, settlers dicovered this land of subtle beauty, good earth, water and abundance of wildlife, which was to be named Sedgwick County. From its Old West past and Chisholm Trail days to the Air Capital of the World, the largest city in Kansas now encircles 110 square miles. A great place to begin your visit is at the Visitor Information Center located in the Wichita Boathouse. The stately Wichita Boathouse, located downtown on the banks of the Arkansas River, is open seven days a week. The staffed facility includes interactive kiosks of area attractions, a lodging reservation center, brochure racks and numerous displays. The America's Cup racing yacht "America' Jayhawk'," and replica of the silver America's Cup trophy are on permanent display. A dozen museums are scattered throughout the city, each with a distinctive or historic cast. The Wichita Art Museum's collection of American art is is the largest in a five-state region. The Wichita Center for the Arts is a diverse art center, fully equipped with classrooms and studios. The Wichita-Sedgwick County Historical Museum chronicles Wichita's early years through artifacts, historical photographs, slides and films. In addition, Old Cowtown Museum offers a memorable opportunity to explore the past of Wichita and Sedgwick County. The Mid-American All-Indian Center showcases the cultural contributions and heritage of America's Plains Indians. The Kansas African American Museum exhibits the black heritage of early Wichitans. A $60 million futuristic creative learning center known as Exploration Place opened in the spring of 2000. The 20 acre riverfront site features four major indoor theme pavilions, outdoor exhibits, two theaters, simulation center, and a park. It also features a community-built science and arts play yard, retail store and cafe. Submerge yourself in the peace of parks and riverbanks. Enjoy the wonderment of unexpectedly encountering art in one form or another - sculptures, murals, fountains, landscaping and architecture. Partcipate in one of many celebrations. Experience the thrill of victory at an athletic contest. Get caught up in the excitement of good music and theater. Wichita has it all! This revitalized historic warehouse district features the charm of turn-of-the-century buildings, brick streets, street lights and boardwalks. Over 200 buisnesses in a ten block area create the largest concentrated shopping, dining and entertainment area in Kansas. The Allen-Lambe House is the last of the prairie style homes designed by legendary architect, Frank Lloyd Wright in 1915, that he considered "among my best." Tour the home and admire the many original furnishings.